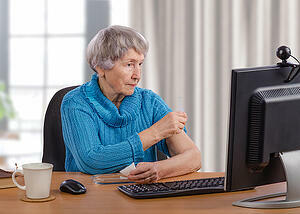 Will Telehealth Benefit Older Adults? For some older adults, traveling to the doctor’s office can be challenging, perhaps because of health problems or transportation difficulties. In previous generations, of course, their doctors might make house calls, but that doesn’t happen much any more—or does it? Thanks to telehealth technologies, you may be able to receive certain medical services without ever leaving home—which means that increasing numbers of people who want to age at home may be able to do exactly that. There are also technologies that can monitor your speech for slurring (which could indicate a stroke or other issues), as well as those that note if you aren’t moving with your normal regularity, are spending lots more time in the bathroom and much more. This information can allow your medical team to suspect problems before they erupt into emergencies. Senior care can more easily be provided to people who live in more isolated communities. These technologies also allow medical teams to more easily coordinate care and communication and provide support to patients for their self-management of health conditions and much more. Experts in the articles we’ve referenced note that in-person visits should continue to be part of your medical care and express concern that this approach makes fragmented health care more likely, which could lead to “gaps in care, overuse of medical care, inappropriate use of medications, or unnecessary or overlapping care.” Insurance reimbursement varies by state and insurance plan, and many people who would benefit most from these telehealth services may be limited in their abilities to use them because of internet availability issues or associated costs. Used strategically, though, telehealth technologies can clearly supplement senior care and, as mentioned earlier, help them age at home with support close at hand.